If you follow the latest anime simulcasts coming out of Japan, you may be aware of the existence of the short length anime series. For these shows,each episode only lasts 5 minutes, or less, in length. Back during the Winter 2013 season, I first discovered this type of show when I finally began to pay attention to anime simulcasts. In fact, I got a good taste of the short format because there were six short series airing on Crunchyroll that season alone. In theory, the short anime format is certainly more than capable of working. The internet has proven that you don't need a full 11 minutes to set up and tell a proper story line. In the case of comedy series, it should be even easier considering you can build up to a punchline in very little time. But can it work for an anime? To start my foray into short length anime, I decided to watch Ai-Mai-Mi, a show about three female students in a magna club. At least, that's what they want you to think the show is about. At its surface, Ai-Mai-Mi is indeed about three students, named Ai (brown hair), Mai (orange hair), and Mi (blonde hair), who attend a magna club supervised by their teacher, Ponoka (purple hair). The problem is, Mai and Mi are super lazy and don't really want to draw and write magna. Also, a bunch of random things keep happening that prevent the girls from getting any work done in the first place. Despite what the show appears to be at first, Ai-Mai-Mi isn’t really about a magna club. In actuality, the show is simply about the random adventures of our three main protagonists. Random things keep happening throughout the show and the girls have to find a way out of the various jams they find themselves in. One thing I noticed almost right away is that this show does not a have a huge animation budget. The art design for the show is all over the place. Visually, the show ranges from super detailed character models to simple character designs to very simple character designs. At times, I found the shortcuts the animation took to be very distracting, mainly because it happens constantly. To be fair to the show, this is a comedy series so it’s more excusable, but it would have been nice to see some more detail actually go into the show’s looks. Right: The show at its best. Left: The show at its worst. In addition to the random animation, Ai-Mai-Mi heavily relies on random humor for its comedy. From the occasional gross out humor to random things just inserting itself into the plot, the heavily relies on making you go “Ha ha, what the heck was that? !” The problem is that the show’s humor relies too much on pure randomness. The ironic secret to random humor is that there is actually though and planning that goes into it ahead of time. Going truly random with your humor is actually less likely to get a reaction out of your audience. Comedy often needs a setup and a punchline. Each episode may only be 3 minutes in length, but that’s more than enough time to create some good comedy. My biggest problem with Ai-Mai-Mi is that it bored me. Despite my non-reactions to the show early on, I do genuinely enjoy the credits sequence, and not because it signals the end of the show. 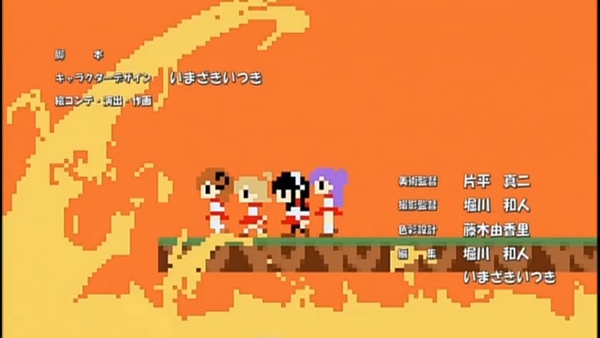 The credits sequence turns the show into an NES style parody that visually looks nice and is presented with some catchy music. The ending sequence is great and it makes me wonder if I would have liked the show more if the entire thing was presented as an 8-bit video game. Early on, I resided to the idea that I would just watch the show, not laugh at it, and then enjoy the credits. However, I noticed around episode 6 that things were starting to change. It felt like Ai-Mai-Mi was relying less on pure randomness and was actually presenting punchlines with more setup and planning. Much to my surprise, I was actually beginning to enjoy watching the show. The jokes never got a huge laugh out of me, but it did get chuckles of enjoyment. The second half of this show is such an improvement, that I have to overall give it praise for turning me around. Not many shows can do that. At the beginning of April, it was announced that a second season of Ai-Mai-Mi was in production. Upon hearing that news I thought to myself if I was willing to watch a second season of this show. Surprisingly, the answer was “yes.” While this is by no means the best comedy you will watch, even in a short format like this, I felt like that show was heading in the right direction towards the end of season and I would like to see if the show continues to improve itself. If you’re interested in watching the show, I would say proceed with caution. Its style of comedy might not be your cup of tea, but you might find yourself enjoying the second half. So I say give the show a chance. It’ll take less than an hour to watch the whole show, and there are certainly worse comedy shows you could be watching. If you’re interested in watching Ai-Mai-Mi, you can officially watch the show on Crunchyroll.